These are exciting times for enterprises looking to create or extend Fiori apps for mobile users. In May, SAP announced SAP HCP, mobile service for SAP Fiori, a new HCP service designed to simplify the process for optimizing Fiori apps on mobile devices. The goal of this mobile service for SAP Fiori is to provide an integrated, end to end solution to address all phases of a hybrid Fiori app on a mobile device, with emphasis on three specific personas – the developer, the system admin and the end user. The Fiori mobile service utilizes existing SAP mobile services and adds new features uniquely focused on simplifying the entire process. Let’s be honest, though, shall we? The first couple releases of the Fiori mobile service were pretty squarely focused on the admin and end user personas. The initial thought was that creating a customized, secure hybrid SAP Fiori application shouldn’t always require a developer, and that app should be easily discoverable and consumable for an end user. Check. But we all know that it’s developers who are REALLY important! So what’s in it for them? Starting with the October release (on or about October 9th), things start to get interesting, with the incorporation of the Hybrid Application Toolkit into the Fiori mobile service. But it’s way more than that. With the October release SAP will integrate Fiori mobile experience into Web IDE, with the goal of providing simple, cloud only solution for delivering an optimized mobile experience for Fiori apps. Access to the Cloud Build Service. 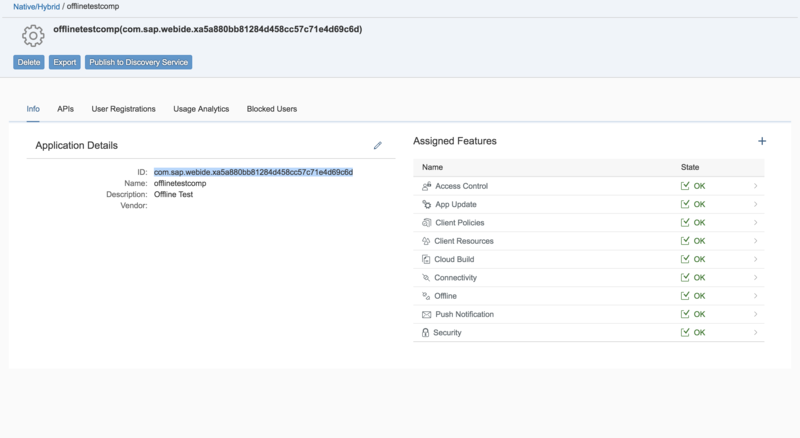 Prior to this release, if you wanted to build a Fiori/Kapsel hybrid application, you needed to install a variety of on-premise artifacts, have a Mac (if you wanted to support iOS), and keep the on-premise stuff harmonized with cloud releases. A lot has been done to make this process simpler, but some customers still find it difficult. After this release, there will be no on-premise installation required. EVERYTHING will be cloud based. When the build is done, a QR code will appear on the screen, and the developer will be able to download the app from SAP Mobile Place directly to his device. He’ll also get an email in case he doesn’t want to wait for the build to finish. Speaking of Mobile Place…. New – This is the result when the build is finished building. In Mobile Place it is visible only to the developer. Trial – This is a limited distribution – only certain individuals can download. Production – Widest distribution, product is general available. Plugin Management – By combining the developer and admin experience, Fiori mobile provides a unified interface for plugin management. Fiori mobile service allows admins to upload plugins, and to mark plugins, both public and custom, as recommended. An app developer can then include those plugins through the same UX into their Fiori apps. If you already have Fiori Mobile enabled, one additional step is reqired – a fiorimobileapi destination must be configured. This process is described in the release documentation here: https://help.hana.ondemand.com/webide_hat/frameset.htm?aa8715ac0a914f12b90fbb8865612c71.html. For Developer/Trial customers, there are a couple very important limitations that you need to be aware of. – There is a limit of 5 cloud builds per day permitted. – There is a limit of 2 Fiori mobile applications permitted at any one time. If you reach the limit, you’ll have to remove one of the apps before being able to create a new one. Please note that this is applicable for Fiori Mobile as well as SAP HCP mobile service for Development & Operations. SAP is very excited about the release of these new capabilities. Our vision is to continue to add integrated features in support of an optimal mobile experience, enabling enterprises looking to run Fiori apps on mobile devices to do so quickly and easily! I tried to setup the new settings on our HCP but unfortunately I cannot find the services. Do you know how we can subscribe to these new features? Hi Daniel – What type of account is it? Is this a developer/trial or a production account? For developer/trial – you should see Fiori mobile as a service. If you are a production customer, you wouldn’t see Fiori Mobile unless you were subscribed to SAP Fiori, cloud service, premium edition – this is how SAP HCP, mobile service for SAP Fiori is packaged (even though it works with both Cloud and on-premise apps) Hope this helps! it is a developer account. I will get in touch with your SAP Partner Contact and check how we can get the needed subscriptions. Thanks for your support. Finally, after a long wait. 1. 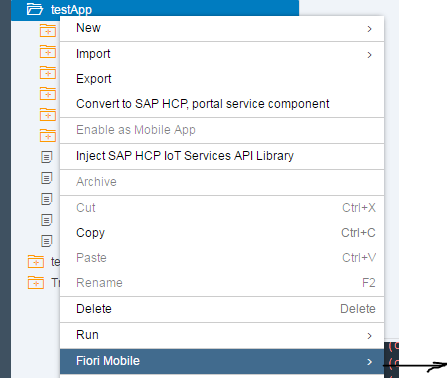 Can you tell for what all templates this ‘fiori mobile’ option is available in Web IDE? Specific to ‘SAP Fiori’ category? Yes! Hope you enjoy the experience. I’m testing the setup on my existing developer edition account. WIll get back to you shortly. After I added the destination and waited 5 minutes, I logged out and logged back into WebIDE and the menu items were there. Did you try that? Take note that the List Report Page (Smart Template) is currently not supported for the cloud build (planned for 1611). It can be packaged using the local HAT add-on. did you find a solution for the missing menu items in the meantime? I face the same problem. Hello Helmut, works for me. After adding destination, refreshed web ide after 5 mins. You have same config details right? yes, the destination was automatically created in my case. It has the same settings as yours and the connection test is successful. In the meantime I noticed that I probably first have to configure the Fiori Mobile service in admin console as explained in this blog. Unfortunately this also does not work for me either. I will create a question to solve this issue. Have you done all the pre-requisites described at https://help.hana.ondemand.com/webide_hat/frameset.htm?aa8715ac0a914f12b90fbb8865612c71.html? And the build sub-menus currently only show for projects created using the following four templates and projects extended from HCP Fiori application. Which template does your project use? Thanks for the post Britt. Just to clarify – This topic is only related to Fiori Mobile Service. Earlier developers could still built their Fiori Apps in WebIDE and had to depend on an Administrator who would use the admin console to build/package the mobile app. 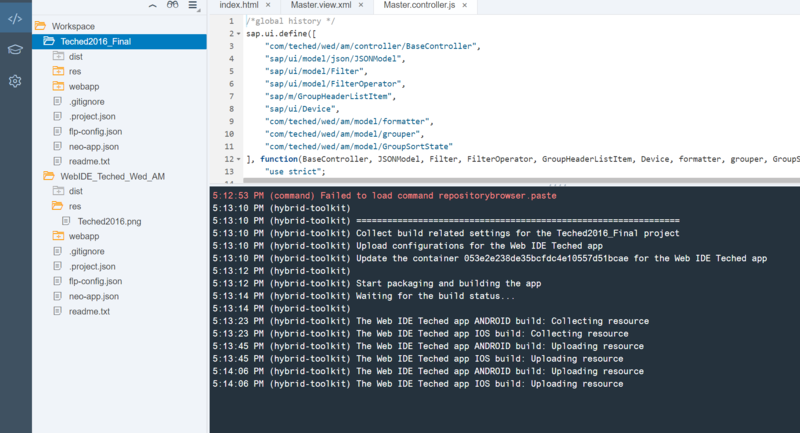 Now the Cloud Build Service is added to WebIDE for developers to build and test the app on their device. This is a great feature. Customers who have “Mobile Development & Operation Service” will still need to install and use HAT on their on-premise system for packaging hybrid apps. Am I correct ? Correct, prior to this release, the developer would deploy to the FES/Cloud Launchpad, and then have to depend on the Admin for packaging. Now he can do the packaging himself. And you are also correct that people sing Dev & Ops and HAT can still take advantage of the local build option. Thanks for that very very useful blog !! If my understanding is correct, customers, with premium cloud edition, need not install HAT on their on-premise for packaging their apps, right? 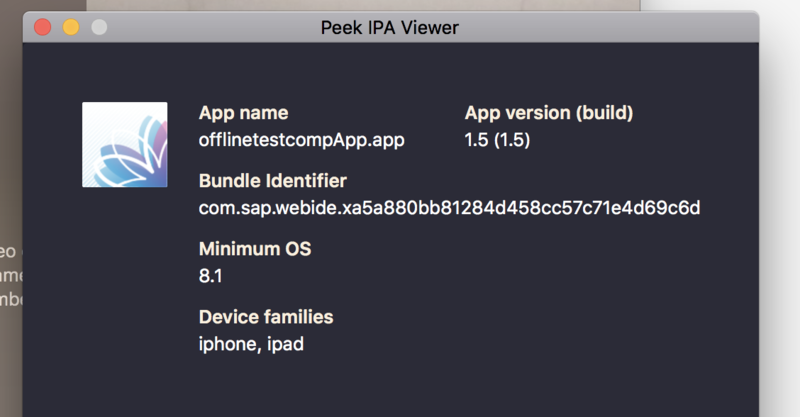 Even if these apps are on-premise, admin can create FES connection(through cloud connector), package them through using Fiori Mobile Service, right? Ofcourse, customers,inspite of having premium edition, can still take advantage of local build option. 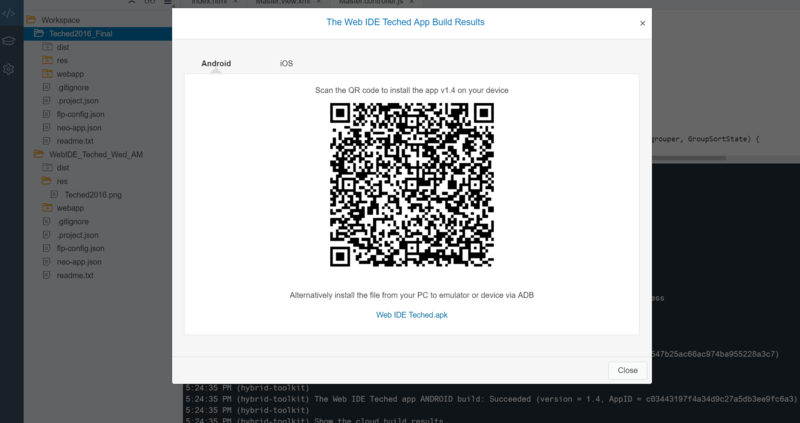 I just tried the new Fiori Mobile and built an Android app directly from within Web IDE. However, my app just force closes after I enter the correct HCP credentials in the login screen. I created a new question and would appreciate any advice.